Real-time monitoring of equipment performance and efficiency. 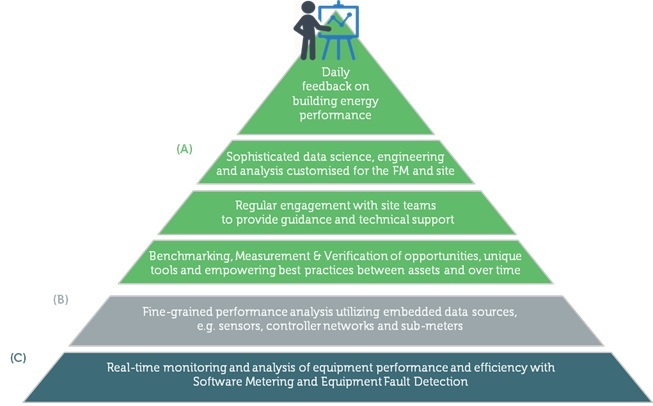 For buildings that are regarded as highly tuned and consistently performing at “best in class” standard (according to their statistical models), we suggest drilling deeper into a building’s data sources to implement fine-grained analytics. Our team are experts at interfacing with complex building systems to extract data and then turning that data into highly refined information and analysis. Our technology is ‘best of breed’ and utilises advanced machine learning to minimise costs and setup time. Critics of fault detection and diagnosis (FDD) systems point out that they often generate overwhelming numbers of alert “flags”, leading to never-ending “to-do” lists which can generate workflows for contractors that do not always justify the time and expense. By helping building operators and owners effectively prioritize system-generated issues relative to other important priorities they have to deal with on a daily basis, such as those impacting occupant satisfaction and customer service, our delivery model overcomes many of the shortcomings of FDD technologies identified in literature and in practice. The pyramid shows how the program pieces together conceptually.